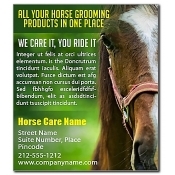 Custom horse care magnets are perfect for horse care services, vets, breeders, boarders, groomers and pet sitters who wish to get their business noticed. These high quality animal and pet care magnets easily make business messages stick over the refrigerator doors of their prospective clients. 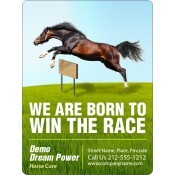 These custom horse magnets are proven to offer long-term business advantage to pet care services or dedicated horse care businesses struggling to attract loyal and quality customers. Avail free shipping anywhere within the contiguous USA. You might have seen that several horse businesses come and go at the snap of a finger. In most of the cases, the love for horses has translated into a business opportunity but it lacked determination to succeed. 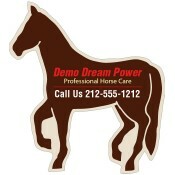 You can save your horse care business from this fate by investing in logo promotional horse care magnets. Owning a horse is a thing of pride for many people and this animal symbolizes power, beauty, grace, strength, nobility and freedom. 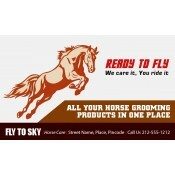 Nowadays, horse owners are far more educated than earlier times and they know about the best services for their pets. In a way, this is wonderful because it means they are actively involved with animal care. However, the downside is that they will be more specific and choosy about selecting a horse care service which fulfills their requirements without compromises. If you own a horse care service, it is entirely up to you to make them understand why your business is superior. You can try some traditional marketing techniques and involve any of these custom magnets for the purpose. You can easily start promoting your business during tradeshows, local fairs, pet shows and other events by handing out any logo printed vet magnets from this category. 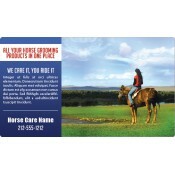 You will be surprised to know that this category features only the best-selling veterinary horse care magnets which have been ordered and re-ordered over the years. If you are dissatisfied with the choices offered, you can select from rectangle and square magnets, oval magnets, circle magnets and animal shaped magnets offered at custommagnetsdirect.com. 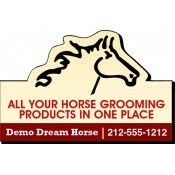 To know more about the horse care custom magnets, their customization, pricing and expected durability, feel free to contact our team at info@CMagnets.com or call us at 855-762-4638 (Toll Free).